The second Poster Monday spot of the day belongs to William Haney, a graphic designer from New Jersey, United States for his poster The Curse of Rigoletto. This poster captures the mood of the tragic opera, both its characters and self-fulfilling prophecy. 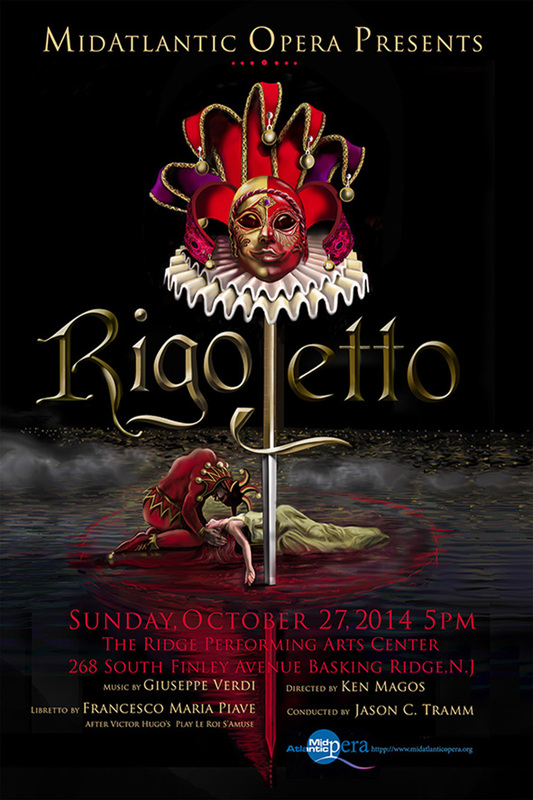 The Curse of Rigoletto was created for the performance of Verdi’s’ opera Rigoletto by the Midatlantic Opera Company. The poster’s theme is built around a curse inflicted by Count Monterone’s on the tragic and insidious hunchback jester named Rigoletto. The imagery of the poster depicts the final scene, showing Rigoletto’s mistakenly slain daughter, Gilda, who was killed by an assassin. “I believe the contrast between the ugly, deformed body of Rigoletto and the beautiful, delicate figure of Gilda creates powerful visual tension” says William. William Haney is a Professor teaching digital design and Illustration at Seton Hall University, South Orange N.J. He was born in Elizabeth N.J., and his parents enrolled him in various artistic training programs at a very young age. William holds an M.FA. from University of Georgia and has been a Professor for 30 years in institutions such as Carnegie Mellon University, the University of Pennsylvania, and The College of New Jersey.